Arnoud Noordegraaf (NL, 1974) is a composer who doesn’t shy away from a strong narrative and an occasional healthy dose of humour in his work. His productions form a class apart within Dutch contemporary music, combining interdisciplinary media in compositions and theatrical forms, resulting in ‘a remarkable unity in style and atmosphere’ (NRC Handelsblad). Noordegraaf studied composition at the Royal Conservatory in The Hague, with Gilius van Bergeijk, Martijn Padding and Louis Andriessen. Also he studied theatre at the Maastricht theatre school for one year, prior to his composition study. His musical style focuses on a theatrical interaction between live instruments and their electronic counterparts; a very surrealistic musical vocabulary, in which instruments or voices produce sounds beyond their natural capacities. The musician’s struggle with an invisible counterpart complements the theatrical struggle of accepting the world as it is, a recurring theme in Noordegraaf’s work. Visually, Noordegraaf conceives and directs his own films, or in his own words ‘composes both in music and in images’. Here also, the music and the film narrative intertwine, creating a universe that is both real and unreal. Often the characters in Noordegraaf’s films try to break though the film screen, sensing there is something there: our world, our tangible reality. Once we have accepted their film reality as ‘real’ this breaking through the film screen raises the question whether our own reality is real or—at least for a brief magical moment, has become a fictional world. In 2011 his Murakami-inspired Tokyo-film-opera “A.M.” premiered at the Holland Festival in Amsterdam. It has been performed ad hoc ever since throughout Europe. 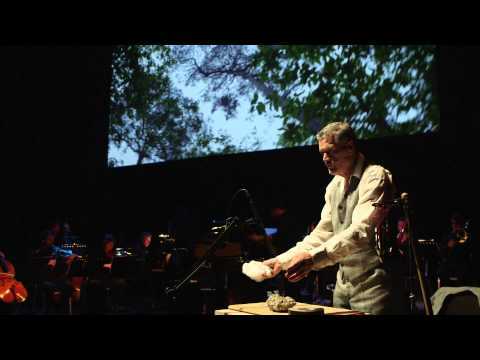 Noordegraaf’s next big music theatre work “UrWald” premiered in october 2013 in Amsterdam. Both A.M. and UrWald received much critical acclaim, marking the relevance of Noordegraaf’s work in contemporary music. Recently Arnoud has teamed up with writer Adrian Hornsby again, for his new opera As Big as the Sky, created for the Holland Festival in collaboration with the renowned Chinese artist Ai Weiwei.